Somethings just naturally pair well with others. Of the above list, the last one is of course, my favorite. 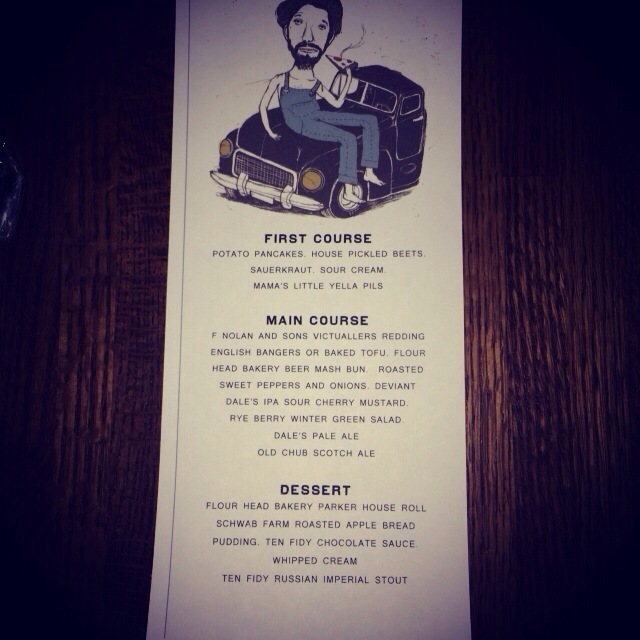 I had the good fortune to attend The Tomato Head’s first craft beer dinner last night. Indulging in the best meal I’ve ever eaten paired with beers from one of my favorite craft beer brands, I had the most incredible dreams all night long. I woke up this morning feeling refreshed and inspired to write about it. 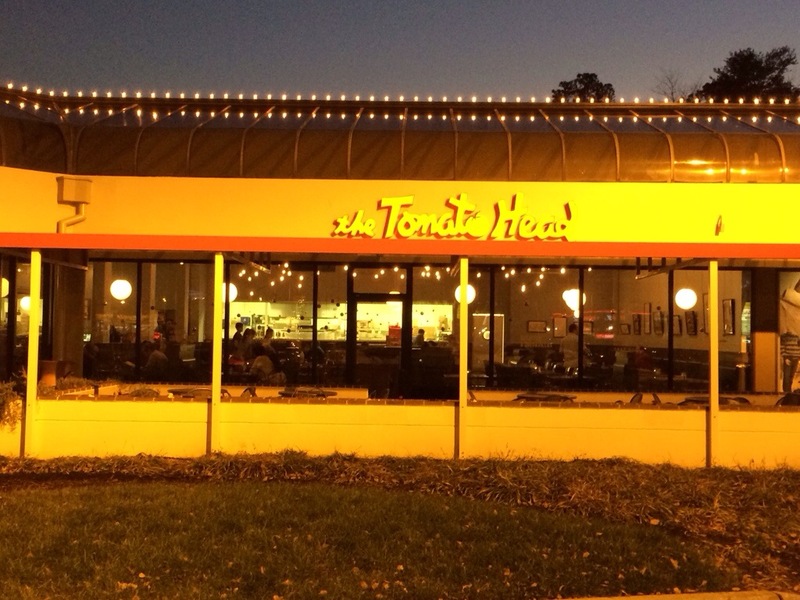 For anyone living in our great city of Knoxville, it would be inconceivable to me if they didn’t know about the Tomato Head. Originally opening it’s doors as The Flying Tomato in 1990, it’s been an anchor tenant of Market Square through all it’s changes and a cornerstone of the Knoxville Restaurant scene. When I first moved here in the late 90’s, it was the one place I knew I could get great pizzas and vegetarian fare. It was the place where I first fell in love with the concept of brunch. I don’t hide the fact that I am an unabashed fan. They opened their Gallery Shopping Center location in Bearden, late 2012. This is where the beer dinner took place. The Tomato Head’s Gallery Shopping Center location. On Kingston Pike, in Bearden. A more recent arrival to Knoxville is the introduction of Oskar Blues Brewery’s line of tasty craft beers. One of the first craft breweries to see the value in canning it’s beer, they started distributing to Knoxville just this year. This is mainly due to their recent Brevard, NC expansion. Previously if you wanted to track down some O.B. you either had to travel or have someone ship it to you. All of their beers are very highly rated and incredibly good. I remember hearing about their Ten Fidy Imperial Stout long before I tried it. When I finally tracked it down years ago, I was blown away. It was one of those rare times where the beer actually lived up to they hype associated with it. A month or 2 ago the first cans of Brevard brewed Ten Fidy finally hit the local shelves. There was much rejoicing in the Knoxville beer scene when this happened. Brewing beer and cooking food have much in common. A good brewer, like a good chef, will know what flavors work together. Texture, mouth feel, presentation and most of all, taste makes a great meal and a great beer what they are. It’s both science as well as art. Both the brewers at Oskar Blues and the chefs at Tomato Head are artisans. For this beer dinner, Mahasti and Sam came up with an amazing meal to pair with amazing beers. First up was potato pancakes topped with house pickled beets from Mountain Meadow Farm, sour cream, and sauerkraut. This was paired with Oskar Blues‘ Mama’s Little Yella Pils. This was a great combination where the flavors of the root vegetables, the tanginess of the sauerkraut and the creaminess of the sour cream complimented the light, crisp and thirst quenching qualities of the pilsner. I could have ate this all night, but the meal had only just begun. 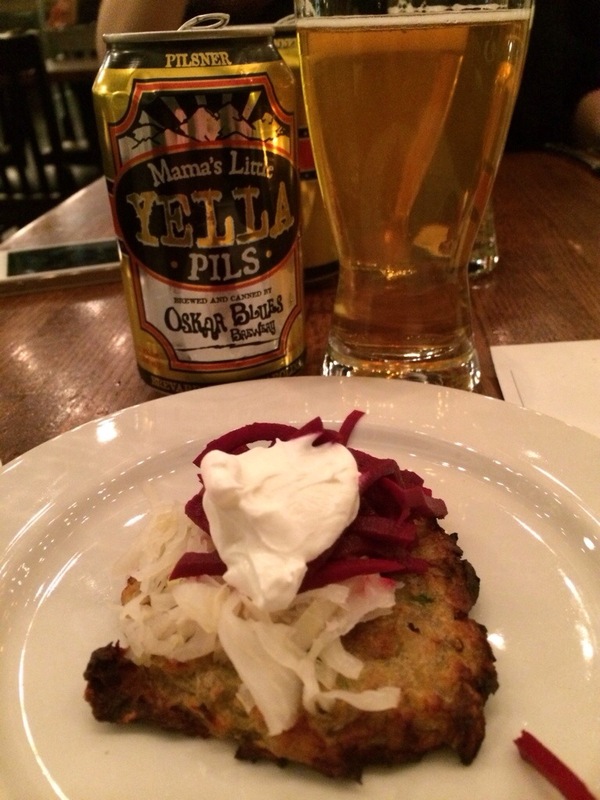 Potato pancake, house pickled beets, Sauerkraut and sour cream paired with Mama’s Little Yella Pils. 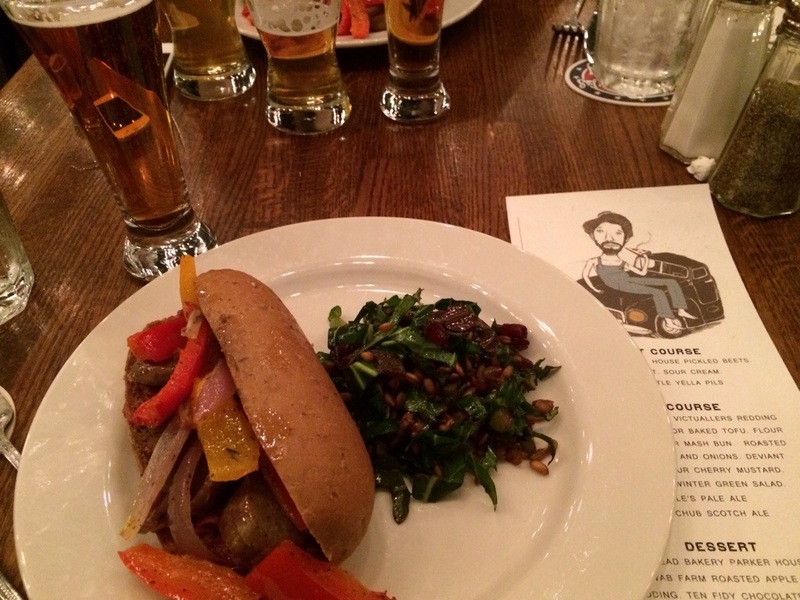 The main course consisted of F Nolan and Sons Victuallers Redding English Bangers served on a Flour Head Bakery Stout bun with roasted sweet peppers and onions, and a sour cherry mustard made with Deviant Dales’s IPA. This was accompanied by a Rye Berry Winter Green Salad. The beer pairing for this course was Dale’s Pale Ale and Old Chub Scotch Ale. When I first read the menu, I was apprehensive. The reason being is that I primarily eat a vegetarian diet. I’m not very strict about it, and do eat meat on occasion. However it’s extremely rare that I eat red meat. Please excuse my ignorance, but I had no idea what a banger was. I was imagining some red beef bits or something. (Hey I’m a beer geek, not a foodie, but I’m learning). Imagine my delight when they brought out the plates and I learned that a banger was an all natural pork sausage link. YUM! I took a bite of the bun filed with cut up pieces of banger, sweet bell peppers and the best mustard ever. It was beyond words. As I chewed I think my eyes rolled into the back of my head and I might have moaned or something, because when I came to, I noticed people at the table looking at me funny. I’m sorry but I couldn’t help it. This was the best food I have had since my last meal at the Tomato Head. The whole plate was incredible. I remember being in a state of bliss and trying my best to keep from tearing up with joy. I found that the hoppiness of Dale’s Pale Ale really complimented the bitterness of the winter green salad. For me, the part of the meal that really stood out was the sour cherry mustard. Everyone at our table agreed, if this was available to purchase in jars, it would be one of those condiments that you put on everything. They way it tasted combined with sips of Old Chub was phenomenal. If the Tomato Head makes this a regular dish, I will soon be homeless having spent all my money to eat there everyday. At this point I felt the early stages of the itis. I was full and satisfied. However, we weren’t done yet. It was time for dessert. 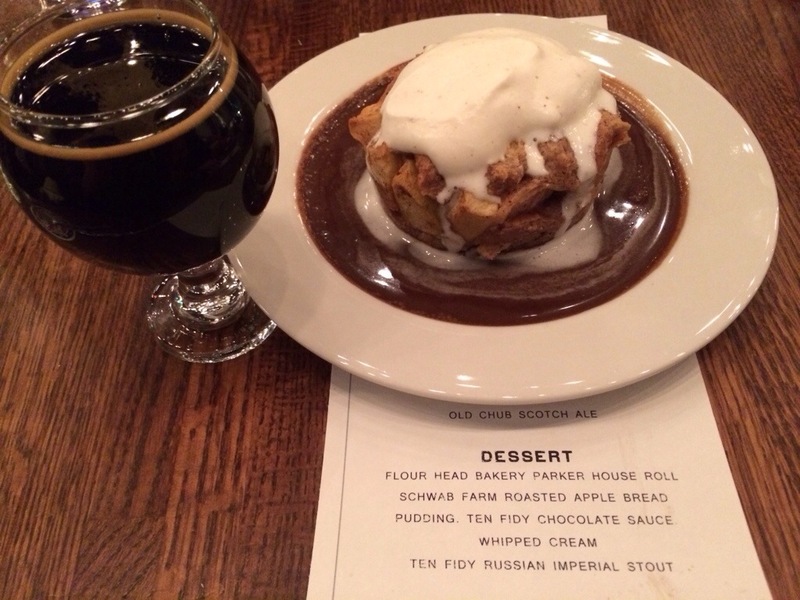 They brought out bread pudding made with Flour Head Bakery Parker House rolls, Schwab Farm roasted apples topped with a chocolate sauce made with Ten Fidy and home made whipped cream. Naturally the beer pairing for this was Ten Fidy, Oskar Blues’ incredible Russian Imperial Stout. For me the Ten Fidy was dessert enough, but with the chocolate covered apples and the bread pudding it was over the top goodness. I fought with myself to consume every last bit, no matter how full I was. As I finished my meal, I sat and talked with the staff of the Tomato Head, and the others at our table. We all agreed that this meal was a huge success. Like I mentioned, this was The Tomato Head’s first craft beer dinner, and I am sure they will have many more in the future. Like all great restaurants, they really appreciate craft beer and how to pair it with a meal. I’m really excited that the downtown location is being expanded. Once the construction is done, they will have a bar focusing on great wine and beer. The timeline for this is February, and I can’t wait! I look forward to frequenting the new bar, and claiming my spot as a regular. I’d like to thank the wonderful staff at the Tomato Head for everything. As far as beer dinners go, this one was the best. I look forward to the next one, and the continued success of Knoxville’s best restaurant.